Any chance of being able to get a download of this record? 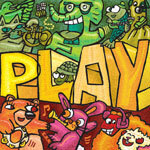 PLAY is for adults and young people who like kid-friendly music that can be listened to over and over and over again without visions of dancing purple dinosaurs or color-coded Australians buzzing in your brain. Another way of saying it...finally, some actually cool music for cool kids.